Why use X-UA-Compatible IE=Edge anymore? The thinking appears to be that this is just as important and useful as <meta charset="UTF-8">. According to Microsoft's Modern.ie documentation it's "best practice" which "ensures Internet Explorer uses the latest engine". Ok, fair enough. 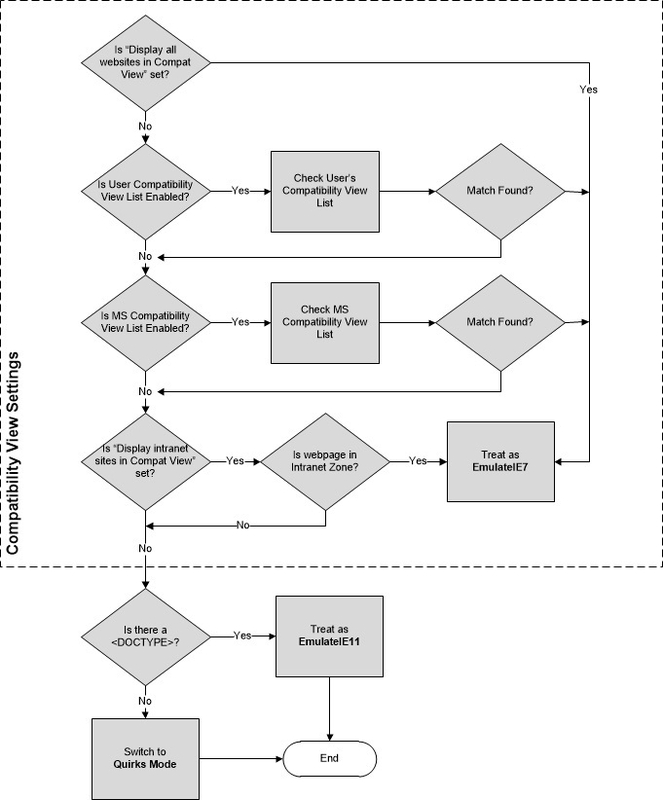 However, if you follow the flow diagram on MSDN it clearly shows that a document without `X-UA-Compatible information is forwarded to the user's "Compatibility View" preferences, and if that's not set then just follow the !DOCTYPE declaration. In other words, unless the user has some Compatibility View settings in place, IE will just follow your !DOCTYPE and use the latest standards mode of your browser for rendering anyway... No need for a X-UA-Compatible IE=Edge statement at all. As MSDN says: "Use the HTML5 document type declaration to enable edge mode". So in what circumstances is X-UA-Compatible IE=Edge needed? If you are considering using X-UA-Compatible anywhere in your project, you should remember that Compatibility View only affects IE8, 9 and 10. It was only introduced in IE8 and was disabled in IE11. Also be aware that IE11 is the only officially supported version of IE at this time. All older versions should be considered insecure. If that wasn't enough reason to convince you not to use it, consider that Microsoft state that IE8 and above already automatically render in Standards Mode when a <!DOCTYPE is present, making it even more pointless. As you can see, if no X-UA-Compatible meta tag or HTTP header is present, it checks the user's "Compatibility View" settings. If the user doesn't have any for your website, IE then checks for the presence of a <!DOCTYPE declaration. If it finds one it automatically uses the latest Standards Mode (aka "EmulateIEx"). If it doesn't, it reverts to Quirks Mode. When Internet Explorer encounters the X-UA-Compatible META tag it starts over using the designated version's engine. This is a performance hit because the browser must stop and restart analyzing the content. The X-UA-Compatible directive is a tool to allow applications to work in the latest Internet Explorer version while updates are made to the application. It was only ever designed for temporary use. The best practice is an X-UA-Compatible HTTP Header. Adding the directive to the response header tells Internet Explorer what engine to use before parsing content begins. This must be configured in the web site's server. In other words, there's better ways of implementing X-UA-Compatible if you absolutely need it. Starting from 12 January 2016, only the most current version of Internet Explorer available for a supported operating system will receive technical supports and security updates. Internet Explorer 11 is the last version of Internet Explorer, and will continue to receive security updates, compatibility fixes and technical support on Windows 7, Windows 8.1 and Windows 10. IE11 is the only officially supported version of IE. The only reason to include the X-UA-Compatible meta tag in your HTML was to override a user's "Compatibility View" settings in IE8, 9 and 10 for your website. In almost every case the user will not have changed these settings (why would they? ), and now those browsers are not even supported anymore. In short: This tag has had its day. If the user is browsing a page located in the "Local Intranet" zone (such as on a corporate intranet), the "compatibility view" is turned on by default. This is when I have used "X-UA-Compatible" to force IE to use the latest engine. As long as it is set to “Edge” it validates as HTML5, and I'm told it only causes IE to re-render the page if the site was already rendering it in Compatibility mode. Still, putting it in the server config (.htaccess, etc.) is better than putting in the HTML of each page. Henri Sivonen made a very useful reference about how browsers chose the rendering mode. You can read it all there: https://hsivonen.fi/doctype/. Not the answer you're looking for? Browse other questions tagged internet-explorer x-ua-compatible or ask your own question. What is the point of X-UA-Compatible? 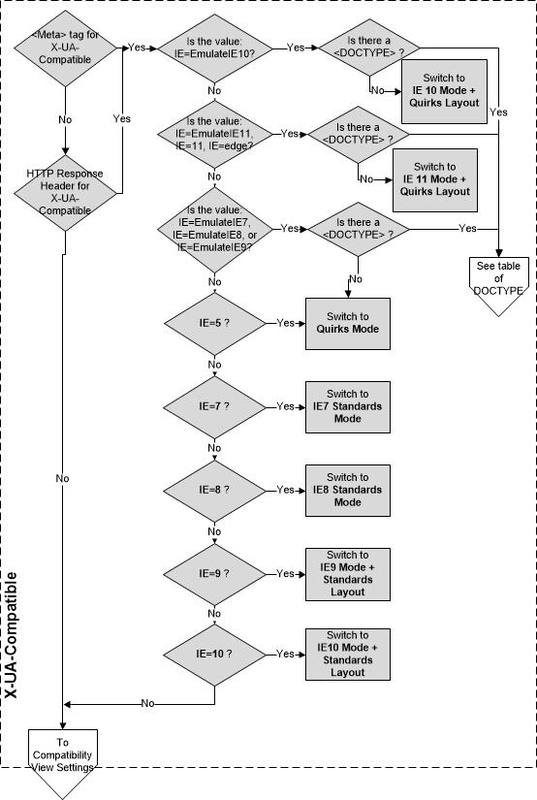 How to forcefully set IE's Compatibility Mode off from the server-side?